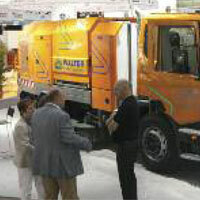 Wayne Sweepers, LLC unveiled an adaptation of its Gladiator mechanical broom sweeper at IFAT ENTSORGA. The new street sweeper, named the Walter Power Sweeper, is targeted towards milling and construction applications in the European market. It is a single engine sweeper mounted on a Scania chassis with hydrostatic drive. Additionally, the unit features a powerful front broom mounted on the chassis bumper. Walter & Co GmbH, based out of Germany, will handle all final assembly, sales, and service of the street sweeper on the European continent. Representatives from the company exhibited the vehicle at the trade show. IFAT ENTSORGA is the world’s leading trade fair for water, sewage, waste and raw materials management. The expo is held on a biennial basis in Munich, Germany, and attracts nearly 110,000 trade visitors from 185 countries. For more information, visit www.waynesweepers.com or www.walter-co.de.